HDR and full color accuracy, regardless of viewing angle. Compared to other aspects of our digital revolution, displays often feel like the component that changes the least over time. Sure, we've had higher resolutions, improved brightness and contrast, and now we're finally getting beyond sRGB and into true HDR colors. The problem is that even with all of these changes, there's still a sweet spot for viewing most displays—look at TN panels from above or below and you'll see massive color warping, and while IPS and VA panels are better, they're still not perfect. LG has the answer, and it's called Nano Cell Technology (a variation on LG's existing quantum dot technology). 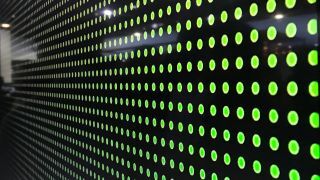 Nano Cell LCD displays use uniformly-sized particles approximately one nanometer in diameter (the 'nano' part of the name) to create more subtle, accurate colors that can be viewed from wider angles than other LCDs. Displays with Nano Cell technology can deliver consistent colors at wider viewing angles with virtually no color difference whether you're positioned directly in front of the screen or viewing off- angle. Tuan had a chance to walk around the display and witness the quality for himself. His summary of the experience: "They look great at any angle, even in CES lighting." Sadly, photos and videos don't properly convey the experience. LG is rolling out Nano Cell technology to their 2017 Super UHD TVs, with there's no word on computer monitor adaptations. The displays also support for HDR content, including an 'HDR effect' mode that works on SDR content. However, that feature processes SDR images frame-by-frame, which usually means increased latency—not something you'd want for PC gaming, then. But in a few years once the technology has matured and prices have come down, we could see Nano Cell computer displays. Or you can just hook your PC up to a gigantic 56-inch 4K display and forget about waiting.